Authentic TexMex Beef Tacos ranks as one of our all-time favorite dishes in the world. 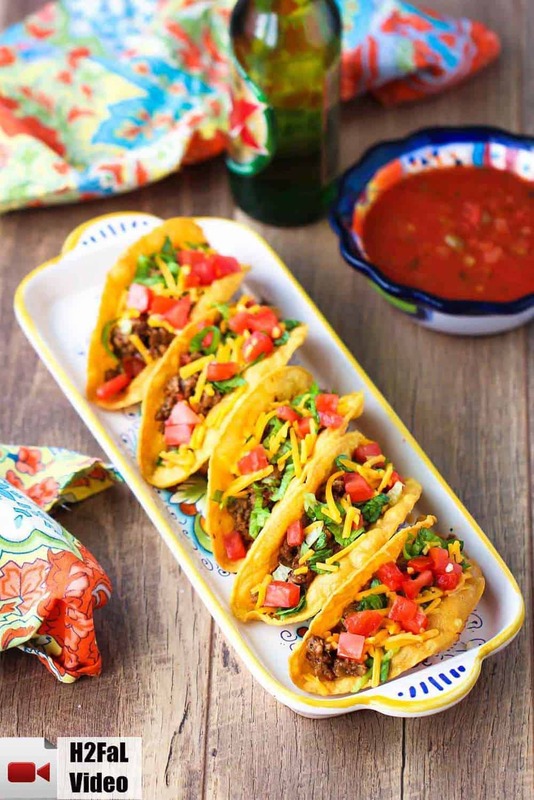 I grew up in Texas and simply could not get enough tacos and it became one of the first dishes I learned to make many years ago, and I’m pretty sure these will rival any platter of TexMex Tacos you’ll find at any good TexMex restaurant. That’s a bold statement, but make these tacos, and I’m pretty sure you’ll agree! 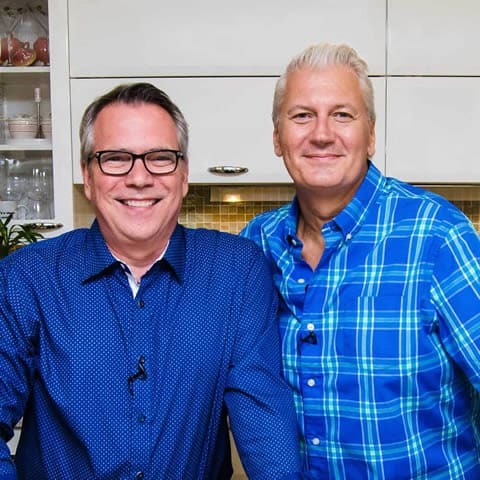 Watch us show you how easy it is to make these incredible tacos!! 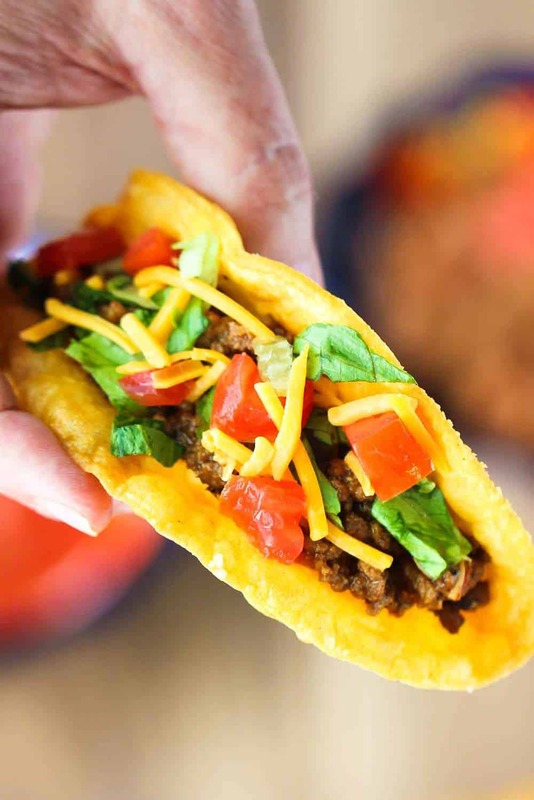 The Loon is certain (and I don’t disagree) that what sets these amazing tacos apart from your average everyday taco is the incredible meat filling, and the perfectly crispy taco shells. The shells make all the difference in giving you that authentic TexMex restaurant taste. Just get a nice sturdy pot (I use my Dutch oven), or use a deep fryer, a get your oil to a nice 350°F, then fry the corn tortillas for about 90 seconds. Using a Taco Press makes this super simple! They are easy to order and super afforable! Just look at those shells waiting to be filled and eaten!! Is there anything much more enjoyable than sinking your teeth into a really delicious and completely authentic TexMex Taco? Well, if there is, I can’t think of it at the moment! You can make the meat and the shells a day in advance and then re-heat before serving. All the fixins can easily be made ahead of time, too! Did we mention that WE LOVE TEXMEX TACOS?! 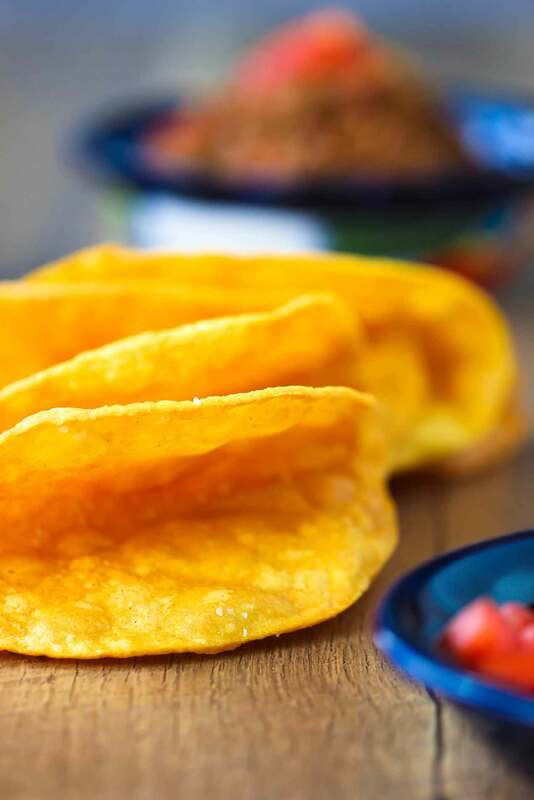 And of course, Authentic TexMex Tacos just beg for awesome Restaurant-Quality Salsa! 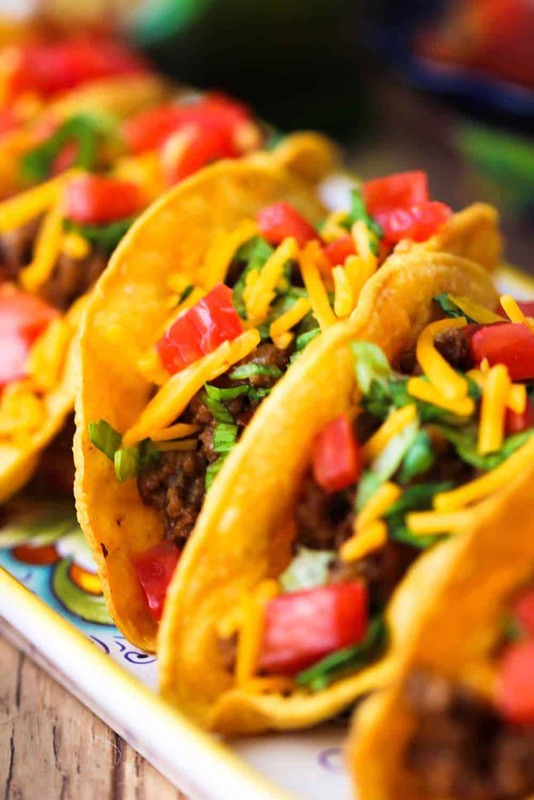 Now, let’s make this Authentic TexMex Tacos recipe! 2 tsp good chili powder order from Pendry's! Heat olive oil over medium-high heat in skillet. Add the beef, cook, until no longer pink. Cook until liquid cooks down, about 12 minutes. Taste and adjust seasonings, adding more salt if desired. Fry corn tortillas in deep fryer, or in a skillet (if using a skillet...place the tortilla in the hot oil for about 10 seconds...then, using tongs and a fork, grab one end of the tortialla and gently fold in half....continue cooking for about 20 seconds...then flip, and cook for another 20 or 30 seconds, and until golden and nice and crisp). I don’t know if you still monitor these posts but… I grew up in the Southwest before moving to Australia where I’ve spent the rest of my life. We have a lot of great Mexican food here, and I’ve tried a bunch of DIY recipes which were all great, but nothing came close to that sentimental craving for genuine TexMex tacos. I discovered your recipe just over two years ago and it literally felt like a wave of delicious nostalgia and was exactly what I had been looking for. I cannot stress how good they turn out every time, and take me right back to burning hot days in the United States. My girlfriend is obsessed with these tacos and we make them every few weeks. Kudos for getting this so damn right, your recipes are amazing. Anyway, thanks again. This is amazing. About to make some tonight and I have my variation of spices that I used which is quite similar to yours and comes out delicious every time but thinking of trying your recipe. Lets see how this goes and I will post my update. Thank you for the recipe and according to your reviews,.. keep up the good work! Can you give me nutritional information? I didn’t use salt, and the flavor is wonderful. Just moved to Austin. Found you while searching for Tex mex taco recipes. Started with the tacos. Awesome! Used Garden of Eatin’ yellow corn taco shells, Hatch tomatoes and chilies original, and Sprouts super greens for substitutes. I’m going to use your recipes to feed the locals and get to their hearts. That sounds great, Joseph! We LOVE Austin. Great city and amazing food. We’ve got lots of TexMex recipes you’ll enjoy. I (Kris) grew up in Texas, so TexMex is true and dear to my heart. Thanks for reaching out to us and please stay in touch! Love this! I hate taco seasoning packets from the store (I think they smell like body odor )! I did not have rotel on hand, so just added 4oz. green chilies. I cut back on the smoked paprika & cayenne a bit too. Added it to 2lbs ground beef, & it had tons of flavor, & plenty of kick for me! Best seasoning recipe I have tried! Thanks! Hi. Is the chili powder pure chili powder, or the blend of spices used in making american chili? Hi Michelle, I use a blend that I buy from http://www.penderys.com. They are the best! kidding me right there is no one out there that knows the trick to real authentic Tex Mex Taco. They do not eat Tacos like the ones I am referring to in Mexico. Its a Texas Thang. I knew a mexican waitress for many years when I asked her for the trick, she wouldnt tel me. Wanting my busines instead..
Who is the loon, I felt like you were calling me a loon, maybe I need to know who this loon is before reading about the tex mex tacos, maybe I jumped in the middle here. I’ll do some research before proceeding. Hi Joel…check out the site and you’ll get the “Loon” reference. I (Kris) am a cook, and my partner (Wesley Loon) loves to eat my cooking. Hence the name of the blog…How to Feed a Loon!